On October 4, 1960 at 1740 Eastern Daylight Time, an Eastern Airlines Lockheed Electra L-188, N5533, crashed following takeoff from runway 09 at Logan International Airport in Boston Massachusetts. Immediately after takeoff, the airplane struck a large flock of starlings at an altitude of approximately 120 feet, ingesting birds into engines 1, 2, and 4. The propeller for engine 1 feathered automatically, and the engine was subsequently shut down by the flight crew. Engines 2 and 4 experienced abrupt thrust losses before recovering, though their recoveries were not simultaneous. The resulting thrust loss, associated thrust asymmetry, and decay in airspeed caused a loss of control that led to the crash. 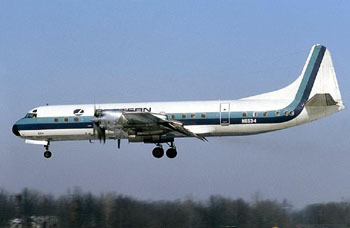 Ten of the 72 persons on board survived the crash.